Detailed Pewter, Gold Plated & Painted Pins, Keychains & more. Handcrafted in the USA since 1984. Canis lupus familiaris, 1.7" long X 1.4" tall. 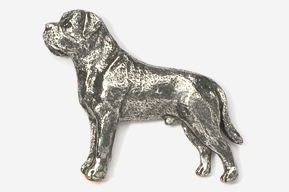 This sculpted Mastiff Pin is expertly crafted into wearable Dog Breed art, sure to please the Mastiff lover. Our especially detailed pins are cast in lead-free Fine Pewter with two short nails and two flat-backed clutches for a secure, non-spin hold. See hardware above. All designs © GG Harris. * Marked fields are required. Copyright © 2015-2019 GG Harris' Wildlife Pins and All Kinds of Dogs Keychains. All rights reserved.